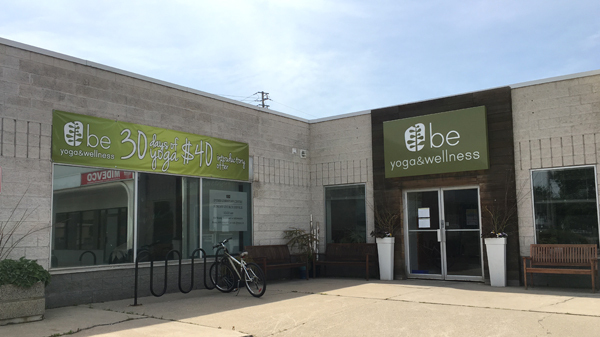 Be Yoga & Wellness, Burlington, ON. 4031 Fairview St. 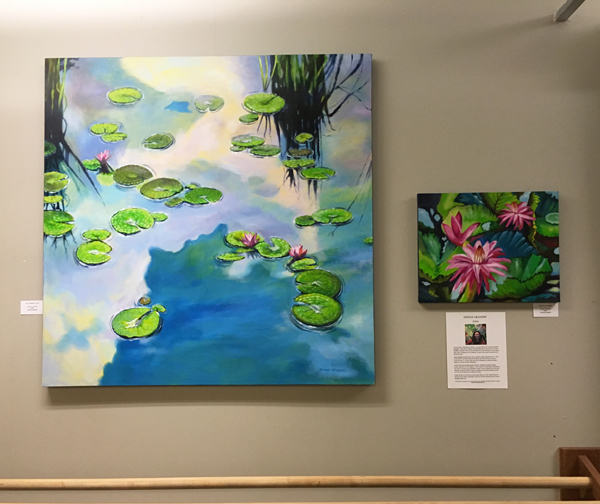 Recently I was invited by Oakville artist Derik Hawley to display some of my paintings in a group art exhibition at Be Yoga & Wellness in Burlington. I thought it was a great idea, especially when I realized it was at Fairview & Walker’s Line, only a 4min drive from my house! 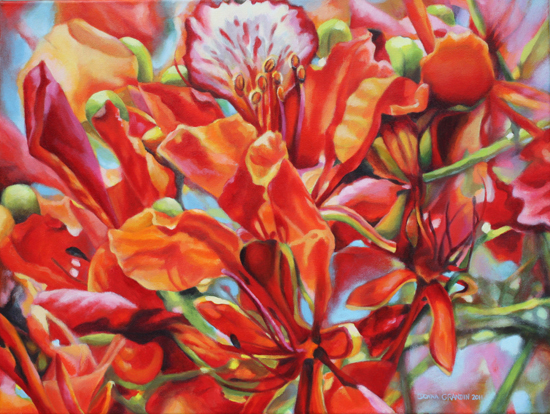 The nature of the space & format of the show, gave me the opportunity to exhibit a wide variety of subjects – florals, peacock feather-inspired abstracts, and some never-before exhibited experimental abstracts. The painting above – Enduring, 30″x60″ – was the first thing I painted for 2016, an experiment in abstraction. It sat in a corner of my studio (waiting for me to figure out what to do with it) until I jumped on this chance to show it. 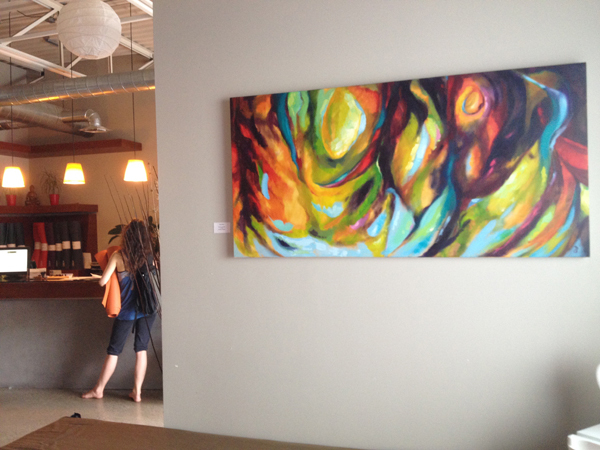 As it turns out, I’ve been told by the manager that it is the piece that gets the most comments & compliments! There is also another abstract painting of mine in the same room, but I’ll leave it for you to discover on your own. It has been hanging in my house since I painted it in 2012, the result of a long, cathartic painting session. Again, although it is an interesting painting, it did not fit into my regular body of work, so I kept it to myself. However, I could not get over the co-incidence that the only text in the painting is “Be” (the title of the painting is “Just be”), and the name of the yoga studio is Be Yoga! So I brought it along on a whim, and it turned out to be a good call. 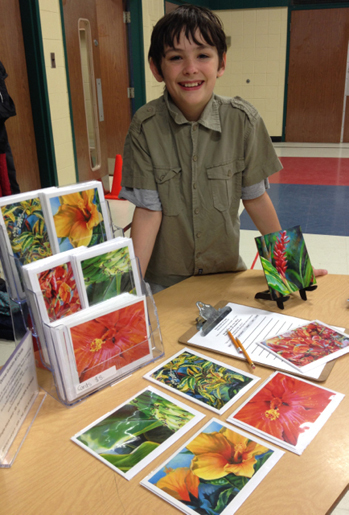 Derik is showing some of his lovely digital images in a variety of sizes. I think they mostly start out as photographs he has taken, but then he manipulates them through computer programs, and the resulting abstract images are mesmerizing. They remind me of stained glass, and kaleidoscopes. There are also some beautiful black & white images from Oakville photographer Bill Smith. And I saw a wonderful painting of a swimmer in a pool – with an emphasis on light creating patterns on the water- that artist Heather Horton dropped off, it’s probably hanging by now. I’d like to thank Be Yoga & Wellness for showing local art, and manager Kelly Foster and artist Derik Hawley for inviting me to be a part of this ongoing group art exhibition. 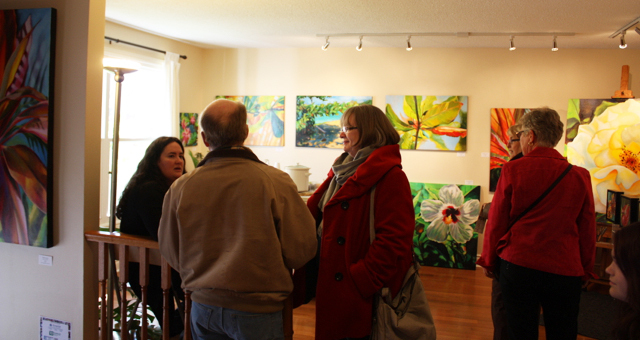 If you’re in the area, please drop in during regular open hours and take a look! The address is 4031 Fairview St., Unit 103. 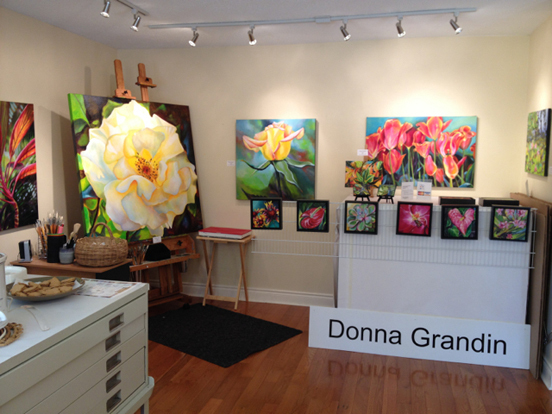 All art is available – see labels for details, and purchases may be made through the front desk. 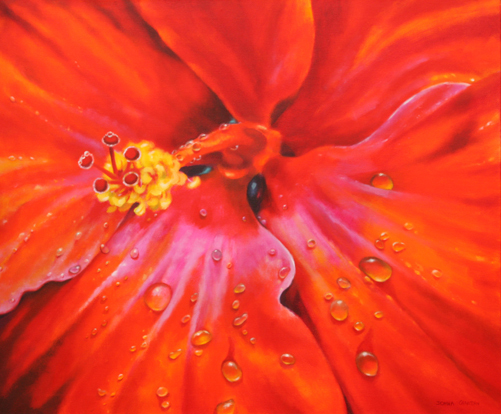 I am so excited about my upcoming exhibition at Windjammer Landing Villa Beach Resort in St. Lucia. We will be hanging the show in the lobby Tues morning, and I will be painting on location for all 3 days, and talking with guests. 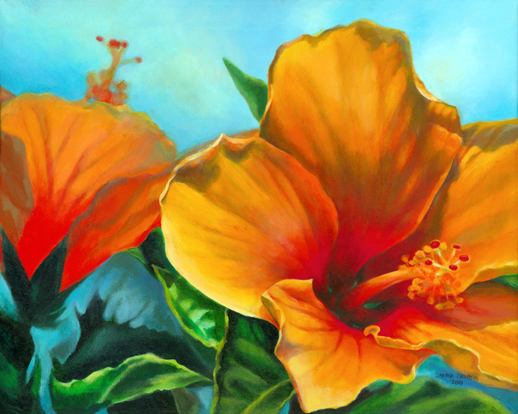 A small selection of my original acrylic paintings, and greeting cards, are now available from the Windjammer gift shop, Island Gifts. I have only been to Windjammer once before, but it is a beautiful location, and I look forward to sharing some photos of my trip to St. Lucia on Instagram. 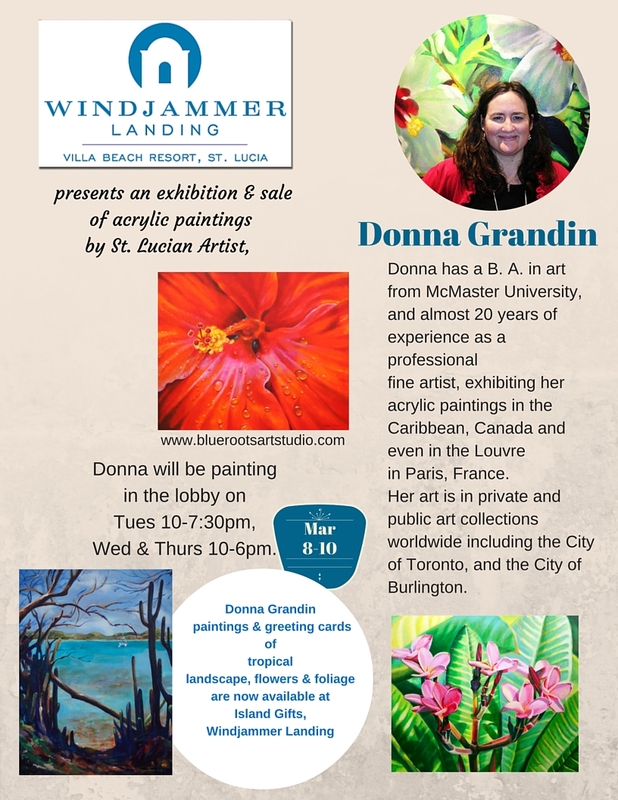 Donna Grandin at Windjammer Landing in St. Lucia 2009. Of course this was a much slimmer version of me. I won’t be sporting a swimsuit this time. 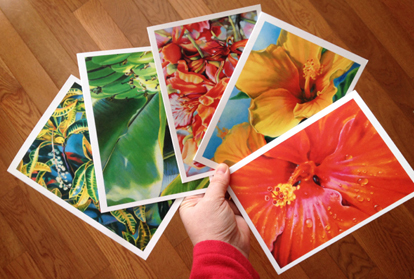 But I will be taking photos of the beautiful tropical flowers, gathering inspiration for new art. 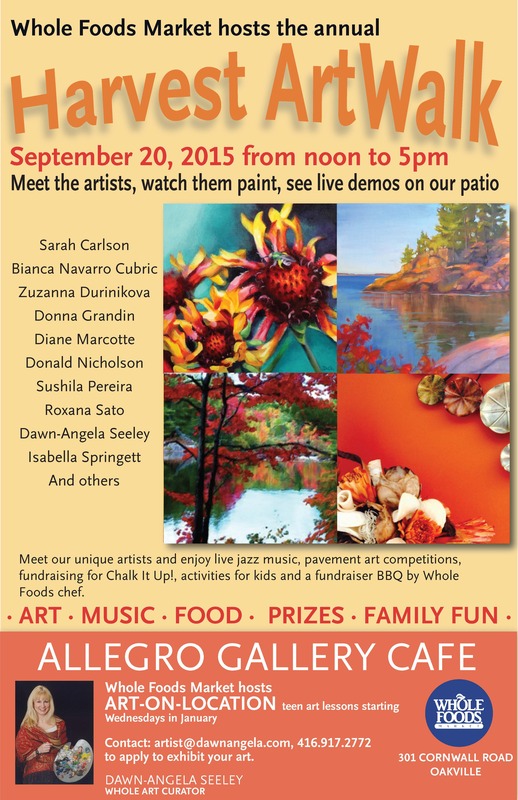 Join me for Harvest Artwalk, a fun annual outdoor event, this Sunday! There will be live music, a charity BBQ, a chalk art activity, and several artists will have their exhibiting their art. 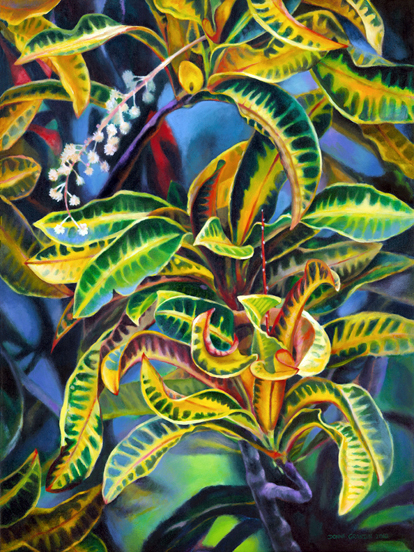 I will be setting up my tent to display a variety of my available paintings, and greeting cards. Hope to see you there! 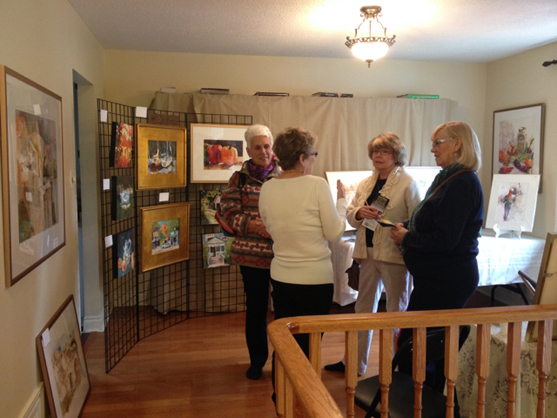 The Art in Action Burlington studio tour through my eyes! This weekend will be two weeks since the studio tour, and I’m surprised to say that life is just as busy as it was before. I was looking forward to taking a breather after, but if it’s not one project it’s another, and the trip to Paris is coming up FAST! Here is a short (41 sec) Video of my art on display for the tour. If you want more details on individual paintings, you can find them on my website. 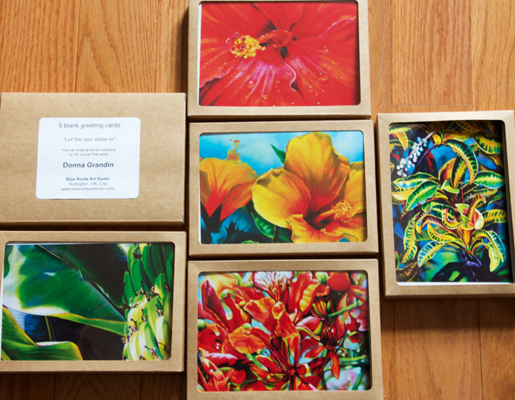 I had a wide selection of paintings this year, now I have to decide which paintings to send where…. 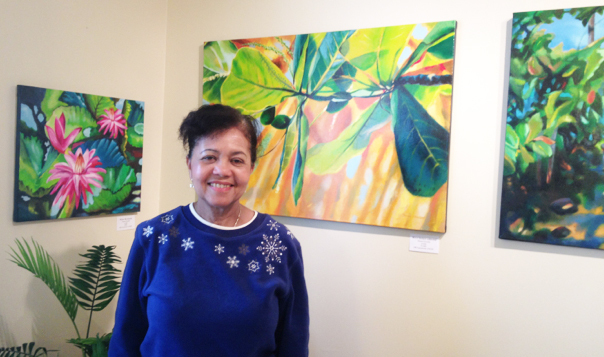 some to the galleries in the Caribbean, some to local group exhibitions – like the Burlington Art Center’s Annual Art Auction in February. Here is a behind the scenes photo taken when much of the studio debris was already cleared out. I simplify so that the attention is on the artwork, but if you want to know what it’s like during the rest of the year, just make an appointment … I’ll need time to clean the floors, because that’s the first thing I let go to make time for painting AND family life. The last couple weeks before the tour involves lots of preparation – ideally I’ve completed all painting for the show by then, so any artwork I do in that time is not done under pressure. 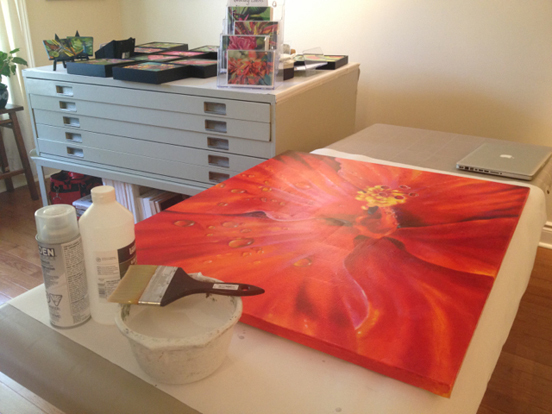 This photo indicates a fraction of that prep – varnishing paintings, framing small works, placing greeting cards in clear envelopes, and spending endless time on the computer doing paperwork (eg. labels), as well as getting the word out through social media etc. Art in Action as an organization does a lot of publicity for the tour, but I wanted to invite everyone I knew in driving distance because it’s the only time of year so much of my work is shown together locally. 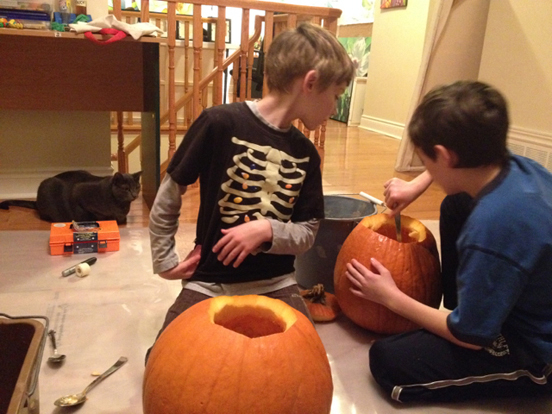 Like when I realized my husband had used my roll of plastic (for packaging), to lay under the boys while they carved their pumpkins for Halloween. Two nights before the tour! Or when he realized something was burning in the kitchen and filling the room up with smoke (an hour before visitors were to come through). My bad. We had to open up all the windows & let the brisk November air in. The first few people who arrived, complimented us on the cinnamon candle we’d lit to cover up the burnt smell. And later on there were a couple comments about something baking … & I could see visitors looking around for home-made cookies! I smiled and nodded. But I had to wonder about their baking skills … just saying. 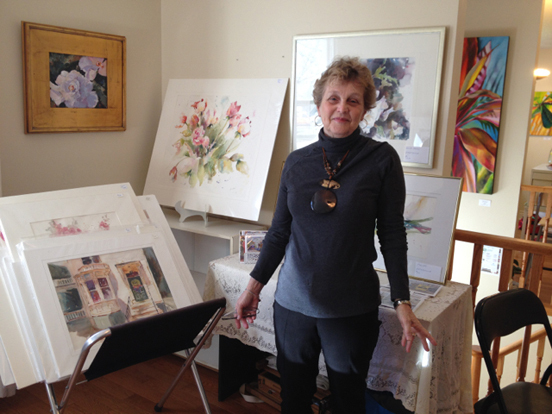 Donna Fratesi set up her watercolour paintings the day before. It was a good thing we had a lot of paintings because Louise Young, who was going to be exhibiting her jewellery with us, had to back out due to health issues. 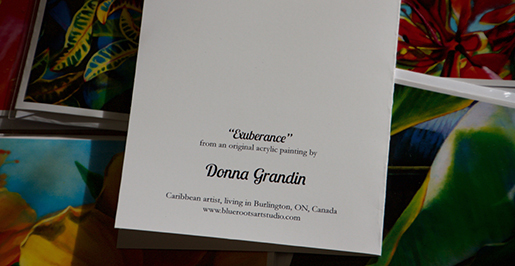 I’d seen Donna do a watercolour demo a few years before when she was a guest speaker at the Burlington Fine Arts Association monthly general meeting at the Burlington Art Center. FYI, there is a guest speaker or artist demo at each of these meetings, and they’re free to the public. She worked casually and loose, making it look easy, but we knew we were watching a master at work. 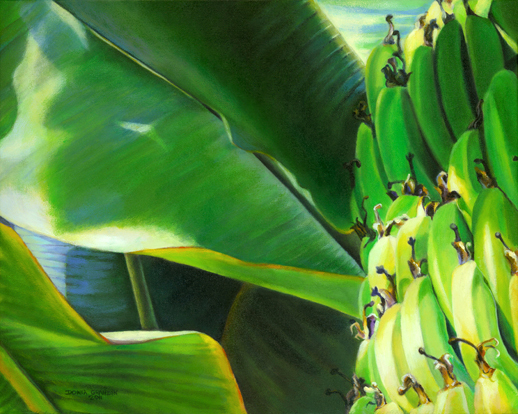 Recently she has been painting in acrylics though, so it’s interesting to see her make the transition after working for more than 25 years in watercolour. Artists are lifelong learners – researching, experimenting, observing, discovering and growing … that’s why art is so much more than a job, it will take as much time and resources as you can give, and more. 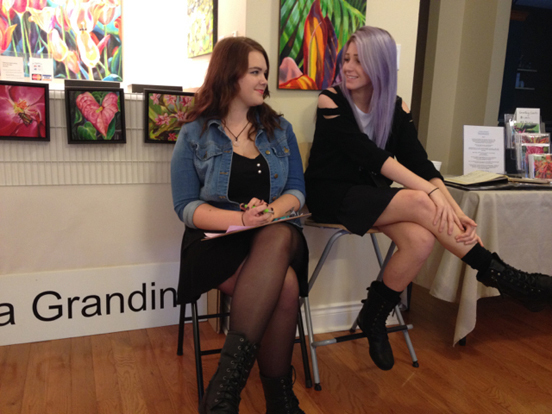 Sam and Amanda were our high school student volunteers, each studio had two students who were earning credits for helping out in their community. We were happy to have some extra hands to take photos, greet and keep tally of visitors, and to explain the draw. Visitors get their brochures signed at each of the studios and if they’ve been to at least one studio and turn in their ballot, they could win $100. towards product by an artist of their choice, and if they’d been to all eight, it is $200! 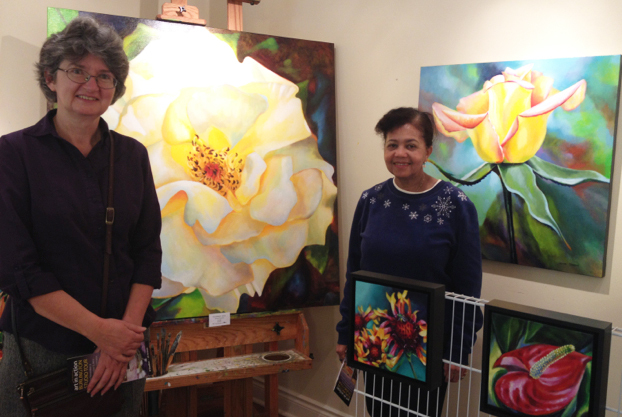 Mary and Ursuline took the train in from Toronto to come see my new work. They made a day trip of it and had a great time. Thanks for coming ladies! Also, thanks to Melissa & Greg who came from Toronto as well. It was lovely to see so many familiar faces, many artist friends showing their support, as well as new, curious faces. I love meeting people. 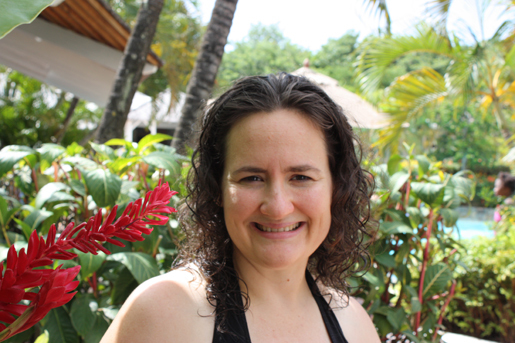 Ursuline is a long-time collector of mine from Toronto. She came up to me at a St. Lucia Toronto Association Gala where I was introduced as the St. Lucian artist currently exhibiting at Toronto City Hall by invitation of the St. Lucia Tourist Board. It turned out she went to school with my Mom in St. Lucia! Donna talking with some ladies interested in her work. It was her first time doing the tour and I think she was surprised at how well she did! 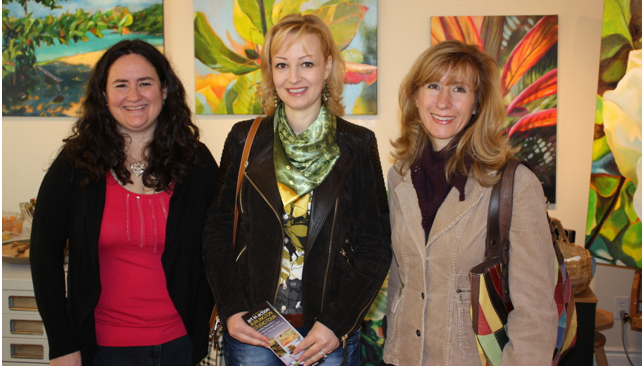 Here I am posing with Angela Paparizo (City of Burlington, Arts & Culture) and Rosanna Dewey (Burlington Fine Arts Association). 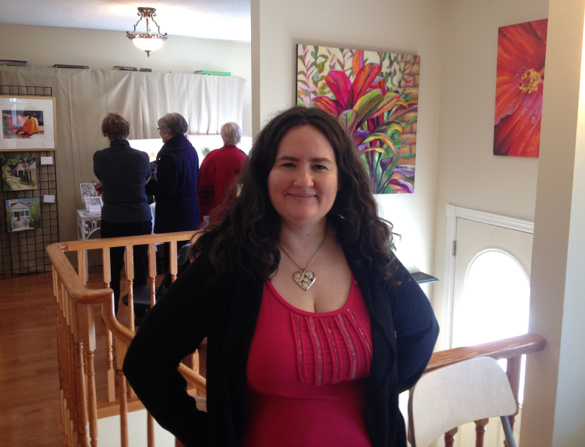 Rosanna is a wonderful oil painter I know from BFAA, actually we first met at a life drawing evening class at Sheridan College. Angela I met through the process leading up to the Burlington city council’s unanimous passing of the city’s first Cultural Action Plan. 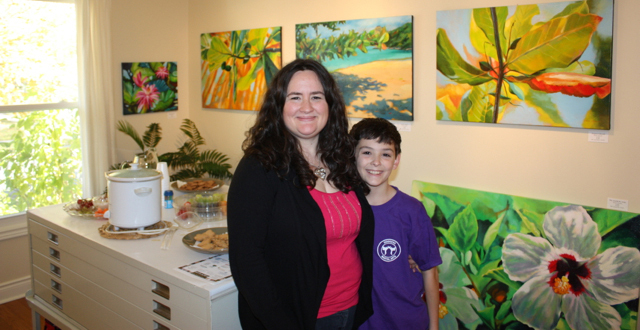 Rosanna and Teresa Seaton (Art in Action) were both on the Steering committee. There were lots of meetings along the way, and it has been awesome to be part of a movement where local artists, musicians, actors, dancers etc. are coming together to form an arts community for the first time in a place where everyone is accustomed to having to do their own thing. I’m excited to see what we can make of this opportunity. For now, if you’re interested in Arts & Culture in Burlington, I encourage you to join this Facebook group. One of my boys shows up to check out the refreshment table … hot apple cider, yum! The other monkey showed up a couple times to show off his gymnastics moves & grab the spotlight. Thank you to everyone who made time for us that weekend, braved the bad weather on the first day, made a purchase, or just came to take a look at what we’ve been up to. Everyone who signed up to our contact lists, who gave us a hand (Sam & Amanda), who helped us get the word out, who sponsored our event, and thanks to all of the other Arts in Action participants this year who did their part to make it such a great event! And of course, thanks to my husband and kids who put up with me and my crazy art life!